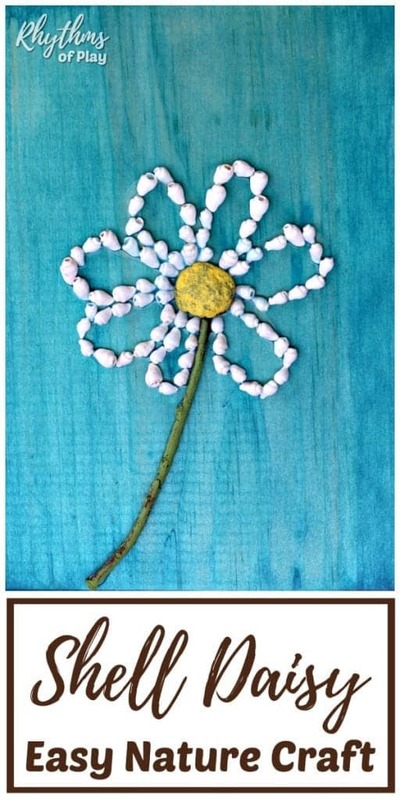 Making a shell daisy nature craft is an excellent fine motor activity for both kids and adults. Nature crafts like this are the perfect way to use the shells you find on your daily adventures and family vacations. Learn how to make a shell daisy to turn the seashells you collect into a keepsake that also makes a great homemade gift idea! We had some shell leis from a trip to Hawaii that we used to make this beautiful shell daisy nature craft. While my daughter was making this as a gift for one of her grandma’s for Mother’s Day, I was making these DIY shell flowers for my husband for our fourth wedding anniversary since one of the traditional gifts for the fourth year of marriage is flowers. My daughter also made this shell sunflower and this shell flower nature craft. 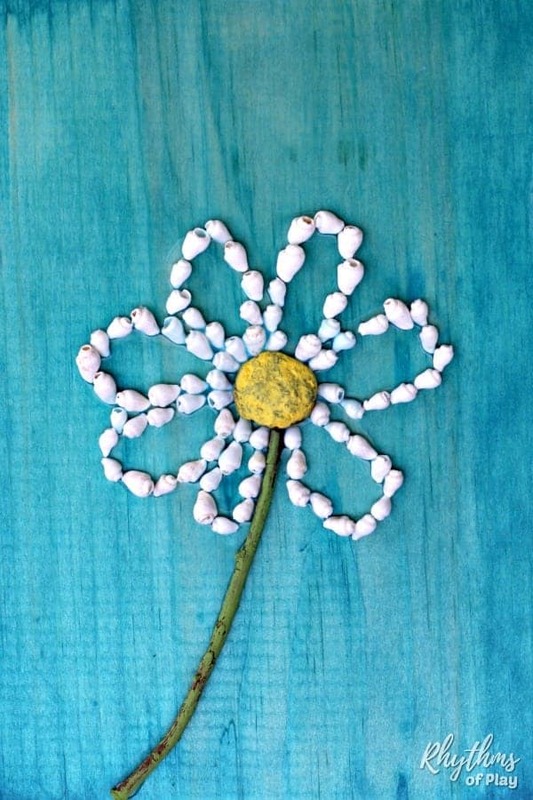 This Shell daisy nature craft is a fun fine motor activity for kids. Fine motor activities strengthen the hand for writing and more detailed hand work. Another fun shell craft is this shell frame kids can make. We like to create beautiful things like wooden bead bracelets and beaded suncatchers while we work to improve our fine motor skills. Sewing is another great way to develop the fine motor muscles in the hand. If you don’t already have a stash of shells you will have to go on a nature hunt or purchase some shell lies. I don’t recommend buying twigs, stones, and shells unless you can’t find them in the wild where you live. Apply turquois-blue liquid watercolor with a 1 inch flat wash watercolor brush to the wood plaque and allow to dry. Apply a Mod Podge with a foam brush to seal and protect wooden plaque and Allow to dry. (Optional) Paint stone and twig. We used bright yellow for the stone and leaf green for the twig. Allow twig and stone to dry completely. Glue twig and stone onto the wood plaque. 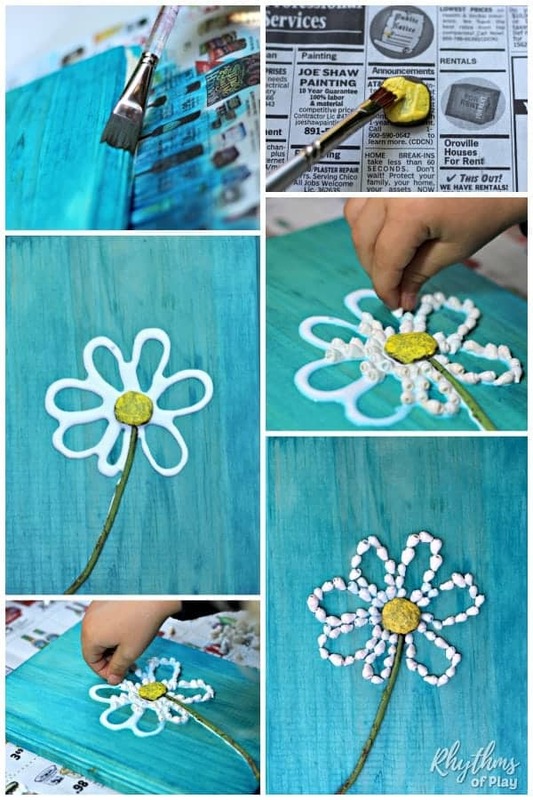 Arrange shells in the craft glue to create daisy petals. (Optional) Apply another coat of Mod Podge on top of your shell daisy nature craft to seal and protect the shell daisy. 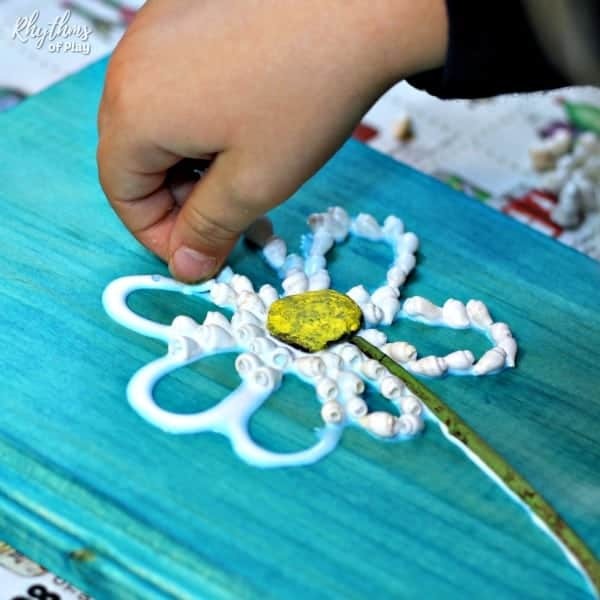 Making a shell daisy nature craft is an excellent fine motor activity for both kids and adults. You can use shells collected on your daily adventures and vacations to make a special keepsake to treasure. Another fun idea is this shell frame craft. Once finished shell daisies make a great gift idea for Mother’s Day, Father’s Day, Christmas, the fourth wedding anniversary, or a birthday! You may also like this awesome collection of nature crafts and homemade gifts kids can make for family and friends.